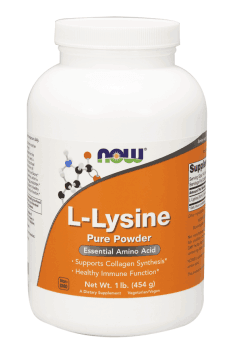 NOW FOODS L-Lysine is a dietary supplement that includes an exogenous amino acid - lysine. The product is available in a powder form, it contains only the active substance, without fillers, dyes or other artificial additives. The preparation shows a number of pro-health properties. It works anti-atherosclerotic, determines the proper synthesis of collagen and increases the absorption of calcium. It promotes a positive mood and can reduce the symptoms of stress. It is also recommended for people infected with herpes virus. L-lysine is one of the protein amino acids, considered an essential amino acid. It is not naturally produced in the human body and must be supplied from the outside. Its good source is meat - beef, lamb, poultry and fish. It can also be found in nuts, seeds and some legumes. L-lysine has a wide range of functions in the body. Thanks to its presence, some hormones, enzymes and antibodies are formed; in addition, it is involved in the synthesis of proteins and the production of collagen. It also determines the absorption of calcium. It has a beneficial effect on the immune, cardiovascular, osteoarticular and nervous systems. It promotes the growth, development and regeneration of the body. L-lysine determines the process of collagen production, which is the most abundant protein in the body, responsible for, among others, the condition of the skin, blood vessels, joint cartilage, bones, ligaments and tendons. Importantly, it not only supports its production, but also protects against degradation, inter alia by inhibiting the expression of the collagenase enzyme. L-lysine also stimulates the absorption of calcium - a key element in maintaining normal bone functions. Proper L-lysine supply can reduce the risk of osteoporosis, promote bone strengthening and improve the condition of the skin. It helps to reduce the visible signs of aging of the body, has a positive effect on the regeneration processes taking place in the body. Enriching the diet with L-lysine promotes cardiovascular health. This amino acid is involved in the production of carnitine which is responsible for the transport of fatty acids and LDL cholesterol. Thanks to this, it protects against the formation of atherosclerotic plaques and clots that are dangerous to health and increase the risk of cardiovascular incidents. L-lysine beneficially affects mental well-being - it helps to control stress and suppresses unjustified anxiety. In addition, it reduces the risk of diarrhea in people who react in such a way under stressful situation. The mechanism of this action is probably associated with serotonin receptors (especially 5-HT4), which are found in large amounts in the gastrointestinal tract, and if overstimulated are responsible for gastrointestinal disorders. It seems that L-lysine limits the hyperactivity of these receptors, and thus eliminates the risk of diarrhea in a situation of high stress. It was also observed that depression and anxiety disorders are more common in people who follow a low-lysine diet. These people are also less resistant to stress. In the subjective assessment of the respondents, the increase in the supply of L-lysine caused a significant improvement in their well-being. What is more, there was also a decrease in cortisol concentration, which is one of the most important indicators of stress level. L-lysine can stop the multiplication of the HSV-1 virus that is responsible for herpes labialis. In a study involving 30 people with active herpes, L-lysine cream, zinc and herbs were used. In 40% of the study participants, herpes symptoms resolved as early as on the third day, while on the sixth 87% of the subjects had no traces of herpes. This is an excellent result, considering the fact that patients struggled with the troublesome symptoms of virus infection for the average period of 21 days (!). In summary, NOW FOODS L-Lysine is a dietary supplement that allows you to easily increase the supply of an important, essential for the proper functioning of the body, amino acid. It works as an element of osteoporosis, cardiovascular diseases and herpes prophylaxis. It is also recommended for people who suffer from gastrointestinal disorders due to stressful situations. One portion 1-2 times per day on an empty stomach. Supplementation is recommended especially for people who excluded animal products from the diet. If the purpose of supplementation is to fight the herpes virus, the preparation should not be used continuously, but it should applied when the first symptoms appear. Lysine increases the absorption of calcium, therefore be careful when using supplementation with high doses of calcium simultaneously. For the same reason, the supplement is not recommended for people with hypercalcemia (high levels of calcium in the blood). Supplement that work as a powerful fat burner and a strong pre-workout compound. Post-workout creatine stack containing 10 forms of creatine. It works anabolic and anti-catabolic.